Explanation: Four NASA suborbital sounding rockets leapt into the night on January 26, from the University of Alaska's Poker Flat Research Range. 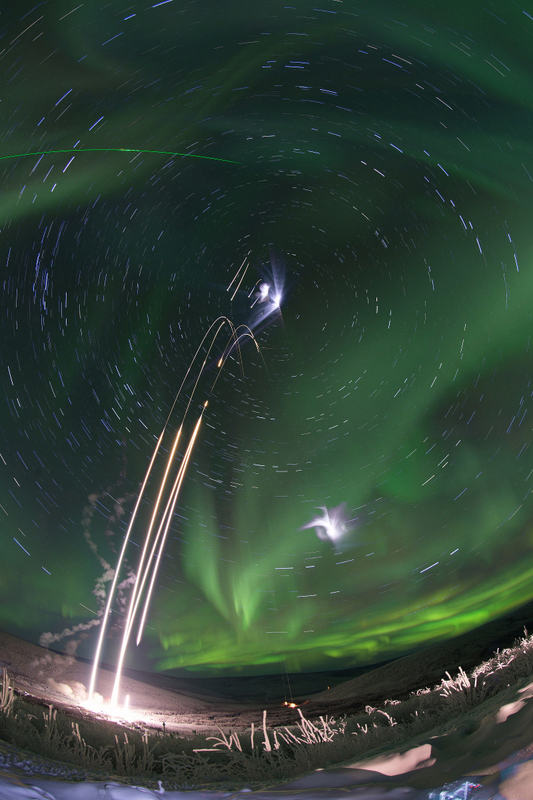 This time lapse composite image follows all four launches of the small, multi-stage rockets to explore winter's mesmerizing, aurora-filled skies. During the exposures, stars trailed around the North Celestial Pole, high above the horizon at the site 30 miles north of Fairbanks, Alaska. Lidar, beams of pulsed green lasers, also left traces through the scene. Operating successfully, the payloads lofted were two Mesosphere-Lower Thermosphere Turbulence Experiments (M-TeX) and two Mesospheric Inversion-layer Stratified Turbulence (MIST) experiments, creating vapour trails at high altitudes to be tracked by ground-based observations.